They are small and neat and look like an animation but they have the full chat features(sending and receiving message in a chat lobby, etc.). 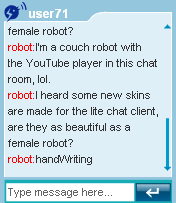 It can be put on any webpage of your site and give your chat another fresh look. To learn more about the feature, please click here.